Eating of a crashed Cessna's wing. I know I said I wouldn’t post every day, but tonight, sitting in a warm pub in Old Warden, Bedfordshire, home of the world-renowned Shuttleworth collection of vintage aeroplanes which I’ll visit tomorrow, I couldn’t resist this one, of dinner this evening on a wing and a perhaps even a prayer. 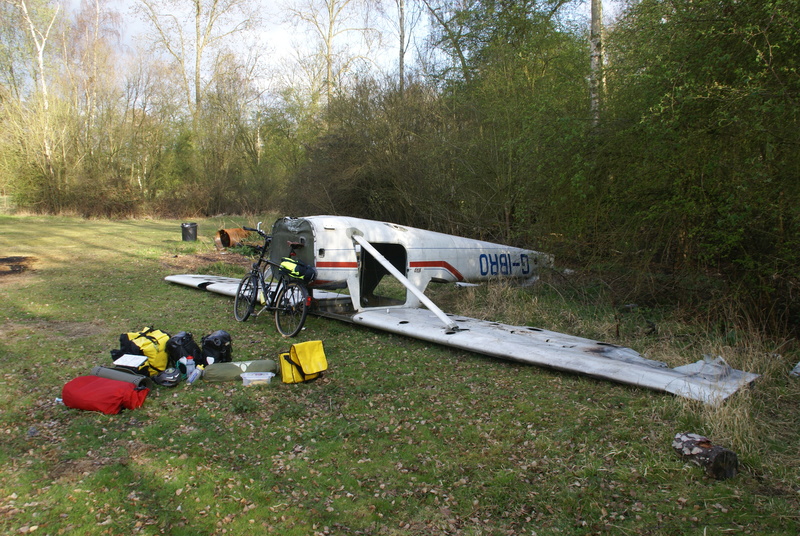 I’m preparing to camp tonight, in a car park opposite the entrance to said collection, where this afternoon I found this Cessna, rather than worse for wear. But an ideal and stable base for my first outing with my new Primus stove. Instant noodles. Worked a treat, and perfect after a fabulous day’s riding from Judy and Julia and Jeremy near Banbury, a rich and warming 60 miles due East into much less of a headwind than I’d expected. I’m trying post more photos on Google+, and having an Interesting Time so doing. Seem to have got them up, but in a completely different order than on my laptop. If you’d like to see more, let me know (email, or comment here) and I’ll add you to my Google RTW (Round The World) circle. I think. Blog daily. Not for us but for you. What a fantastic diary! Mark, it was an absolute pleasure having you to stay – Dad is so envious of you going to the Shuttleworth Collection and has been trying to rope Mum and I in to going along with him next time as well…I can’t say we’re convinced yet! I hope you find it as riveting as him and continue to have a brilliant time once you manage to drag yourself away from all the planes and back to the (much cooler) standard psychlotherapist mode of transport. We look forward to following the rest of your adventure, best of luck J, J and J.
Brililant. Thanks everyone for voting. The twice a weeks have it, though every day also put in a strong showing. Works for me too – ideally anyway, and might sometimes be less sometimes more. Last England-end dash for Harwich tonight, and overnight ferry to The Hook. So far so continuing good – a phrase I must stop using.